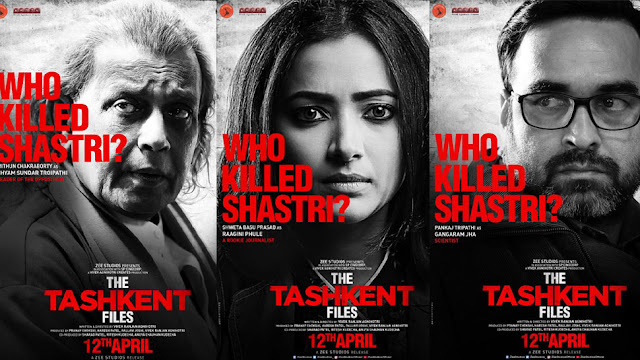 Showing controversial aspects of history can be a creative freedom of a filmmaker, and director Vivek Agnihotri made a film on 'The Tashkent Philes' under the same Creative Freedom. The most controversial chapters of film history, i.e. independent of the country's second Prime Minister Lal Bahadur Shatri, have been woven around the death of the former PM, where questions have been raised whether the death of former PM was a natural death due to a heart attack or signing the Tashkent agreement After he was poisoned? Let them know that his death occurred on January 11, 1966. Why was not his postmortem after his death? Why were the marks of cuts on their body in place? When his earthly body was brought to India, why was it swollen and black? People are questioning the director Vivek Agnihotri about the intention to make a film on these questions, because the facts that point to the movie climax and they point out unilateral. Especially when the election season is on its face. The film came into controversy on its release, when Shastri's grandson received a legal notice from the director about the ban on the release of the film. The story of the film begins with the challenge of bringing scoops to a highly ambitious political journalist. This journalist Ragini (Shweta Basu Prasad) has given her ultimatum to her boss that within 15 days she will have to take a scoop, otherwise she will have to lose her job. After that, he gets a lead on his birthday, which is about the death of former PM Lal Bahadur Shastri. It is provoked that if a controversial aspect makes it accountable to the government, then a huge scoop can be created. After that, Ragini joins in investigating and teasing with his questions that the previous PM's death was natural or not? After that, Political leaders like Shyam Sunder Tripathi (Mithun Chakraborty) and PKAR Natarajan (Naseeruddin Shah) constitute a committee to know the truth about these questions despite being anti-each other. In this committee, people like Ragi and Shyam Sunder Tripathi, activists including (Indira Joseph Roy), historians Ayesha Ali Shah (Pallavi Joshi), Omkar Kashyap (Rajesh Sharma), Gangaram Jha (Pankaj Tripathi), Justin Kurien Abraham (World Mohan Badola) Is chosen. The questions raised in the side of the issue and the questions raised by the committee, such as deepen, are many sensational disclosures in the story. Some people have to lose their lives and it helps the tadgina in the former detective Mukhtar (Vinay Pathak). There are many other characters in the story, which also reveal the conspiracy theories created in 1966 and also the conspiracies and threats to be associated with Ragini. Director Vivek Agnihotri has used many historical books, news, references and facts in sensational fashion to make his film universal, but has also given a huge disclaimer that he has also taken cinematic liberty, but sorry Can not properly execute your issue. In the first half, the story was drawn and cumbersome and in the second half the drama becomes so much that director Lal Bahadur Shatri starts to look uncomfortable to prove the issue of untimely death. They prove their point in the film's climax, but if you have no way to test the credibility of the fact they have shown, then your dilemma remains as an audience. The cinematography of Uday Singh Mohite is fine, but the background song of the film produces Distherbans in the story 'Sab Chal Hai'. The film's strength is its finest cast. All the actors have done a fine job. Though Nasiruddin Shah's role is very small, but Mithun Chakraborty has done a lot of fun in the role of Shyam Sunder Tripathi. It is nice to see Pallavi Joshi on screen after a long time. Pankaj Tripathi, Mandira Bedi and Rajesh Sharma have played their roles through their capable performances. Shweta Basu Prasad as Ragini has given a PowerPacade Performance He has done this compacted role very well. Why See: Fans of historical movies can watch this movie.